2)DAS charging is completely dead during ARE/Clear. From #1 and #2, you may notice that the only other time DAS would be able to reset is if you press left or right during active time. The DAS timings in both games are 16 frames initial delay with 6 frames between shifts after that. With the majority of play being at 1/2 G, you really don't want to have to deal with that 16 frame start-up. As a DASer, your ideal placements would be at the wall, neutral, or -- if you feel comfortable doing so -- tap placements achieved through DAS skill stops. The neat thing about wall charge -- and what I presume to be its originally intended use -- is that it guarantees pre-loading of slides. I have a feeling the programmers recognized that DAS should behave consistently in this case. It is no replacement 60hz rate, but I'm grateful for it nonetheless. The other wonderful thing about it -- as you may have guessed -- is that you can use it to pick up charge if you had to compromise with a tap. Bear in mind that a pre-loaded slide will leave you with 10 frames on the counter if you're playing at level 19 speeds. If 6 frames will make or break your next placement... well, I'd just hope it doesn't come to that, haha. Also note that the pieces spawn one column further to the right than usual. Couple this with strictly right-handed rotation tables for S/Z/I and you'll find that placements on the right tend to be easier to reach. Use this information as you will. Sometimes I'll attempt to use a placement on the right to charge DAS for an upcoming placement on the left. I'm not sure if this is advisable, but it seems to work sometimes, haha. Another one of my "scrub optimizations" I sometimes implement is to DAS as much as possible to the walls to fill out each side of the stack and work in the middle afterward. One of the things to note about Tetris + Dr. Mario is that every piece has a post-ARE 12 frames of active time where gravity has no effect. This means you can resist the 1G speeds much more effectively as a DAS user than you would be able to in the NES version. However, it is still quite a tall order to fill, haha. It could be attributed to a variety of the behaviors described above. Accidental wall charging leads to some pieces being unexpectedly well charged to reach their destination. Also, I wanted to point out something I read in a YouTube comment by Jonas, one of the few players to max out NES Tetris. If a DAS'd piece is going to fall short of its destination, wait until the last second and give it one last tap. What you're effectively doing is sacrificing your DAS charge to push it slightly over a 10hz repeat rate rather than wait for the next iteration. Luckily, you'll probably have an opportunity to get wall charge and have things ready for the next piece if you're throwing a piece over that far. Wow. 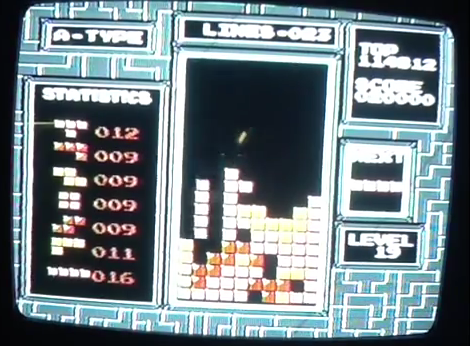 a tetris game predating Kiwamemichi has the feature of delayed gravity. I seem to remember that a phenomenon similar to "neutral stored DAS" exists in some TGM games. I learned about it from the same reference that explained "DAS bald spots" at various points in ARE. It appears The New Tetris for N64 also has wall charge to an extent, apparently to make up for the pieces' larger-than-usual hitboxes associated with the way TNT64 implements smooth gravity animation. Carbon Engine (used in freepuzzlearena and TOD) had wall charge, but I never got around to putting it in Lockjaw Engine before Flag-gate put Lockjaw and LJ65 on hiatus because 1. I figured that most players would be using 60 Hz DAS anyway, and 2. the only mode that requires a lot of precision sliding is square gluing mode. "One of the things to note about Tetris + Dr. Mario is that every piece has a post-ARE 12 frames of active time where gravity has no effect." Then it ignores g.y_speed until u.state_time has expired. that that is is that that is, that that is not is that that is not, that that is is not that that is not, that that is not is that that is, is not that so? Hmmm...a last moment tap? That could change everything, if properly mastered. If I had a nickel for every time I was SURE that I had enough DAS charge to get a piece where I needed, but actually did NOT, well I don't know how much money that would be, but a quick estimate suggests I would have at least $3,000.00 ....My usual response is to just watch helplessly as the stupid tetramino shifts over whilst being one space lower than it is supposed to be, and gingerly land one column right of its destination, creating an insurmountable wall that can never be hopped over, as tears fill my eyes. But a last split second tap? In that second frame? To "hop" the last space? Is that possible????? Also, in SNES, I could've SWORN that I was charging DAS whilst waiting for line clear and ARE....but perhaps I was mistaken by 12 frames of no gravity?? Yeah with slow autoshift, you can actually beat the autoshift and squeeze out one extra column by releasing the pad when it's one short and then tapping. Of course this ONLY works if it's going to land one short without it. Otherwise you need to hypertap from the start. Yeah, think of it like getting one more tap in during that time you'd normally be waiting for the next move -- that way it gets in before the piece touches the ground. The cost is that you lose your momentum to the tap and -- barring a _second_ extra tap for a tech recovery off the wall -- are now in an extremely dangerous position, but it's better dooming yourself to failure. Go for broke! As far as I can tell, the SNES behavior just seems like there is charging because of the extra "hang time." I haven't picked it apart at length (read: disassembly), but my initial experimentation seemed to indicate that (if nothing else) you couldn't pick up a full charge across entry delay. that extra taps works only once in a while for anyone (including jonas so far as what he said). I thinks its just too much to master it. Best to stay within the confines of a full DAS charge. I also think that doing it, unless you can wall charge with that same peice, will kill of all your charge. I just thought of something that could potentially be way easier than an extra tap. This is more or less only referring to a longbar, which is the piece that typically kills me when it fails to reach the side of the matrix. When I see it is going to fall short, I should just flip back horizontal, which makes an easily clearable line. Or learn to not flip it at all unless it is going to make it, but I usually flip pretty early, so I will have to go back and re-train myself to wait to flip and study what it looks like when it is going to make it and when it is not. The same could be done for L's and J's, which can also end games when stacked vertical and short of desired column. Everybody else probably already does this, but it was a revolutionay thought for me! Ok, Alex. I'm going to break some stuff down like I have no clue of what I'm talking about because, um, that might be the case. The DAS timings in both games are 16 frames initial delay with 6 frames between shifts after that. I feel dumb starting here, but if I'm thinking about this wrong, it's going to affect my other questions. Let me put it this way: 16 frames to move one cell horizontally and then 6 frames to move one cell horizontally thereafter. Yes? Assuming my understanding above is correct, I may be confused about your "6 frames" remark. Here's how I'm interpreting that: "If you were counting on having 6 frames when the next piece starts moving and not 10, um, sorry about all that." Does that sound right? Also note that the pieces spawn one column further to the right than usual. With charged DAS, pieces start further right than if you have no stored DAS? I clear a line(s), holding left w/ seemingly full DAS, but when the next piece appears, it won't make it to the side as the previous piece did. I'll have to pay attention the next time it happens, but a DAS reset (if you will) isn't immediately perceivable to me. The situation occurs when I am holding to the left and never take my thumb off of the D-pad. If I don't clear any lines, holding left from piece to piece maintains my DAS charge, as it should. Continuing to think about this, I have to be making it to the left wall or slotted in some way to clear something, so I remain perplexed on why the next piece wouldn't seem to move as far left...unless this is the "fully charged DAS starting a piece further right" thing, if I'm even understanding that correctly. I also may just be missing something completely. So...yeah. I'll stop asking questions now. Don't feel dumb, it's a great question -- best place to start is the beginning! Yes, that's right. The piece of course moves instantly for each tap, but after that first tap shift you have 16 frames to wait for the first autorepeat move, after which they come every 6 frames after. "If you were counting on having 6 frames when the next piece starts moving and not 10, um, sorry about all that." Does that sound right? In this case, it's a difference between having full charge and slightly less full. Every time a move occurs, the way it "sets the schedule" (as it were) for the next movement is to set the counter back to 10 so it must tick back up to 16 -- a 6 frame wait. Whenever you "have DAS," you're somewhere on a spectrum of 0~6 frames from the next move -- you're either closer to the negative/falling edge or the positive edge. If you buffer a slide under a tight space at Level 19, the move "schedule" changes slightly given that the first move of autorepeat happens right before lockdown. If you have full DAS, you'll see move, 3 row falls, repeat. If you buffer that slide, we need to back up to the previous piece to have an idea of the move order: you buffer the move and have 16, it drops next to the space to slide into and moves and leaves you with 10. Then, I suppose I wasn't considering that you have another tick before the piece locks into place -- in that case, I suppose the next piece should enter with 11 on the DAS counter, or 5 frames before the first move. I'll try to make a comparison GIF or diagram slides or something. But, if I did this right, entering with 11 frames on the counter should yield: 2 row falls, one move, followed by one row fall on the very next frame, repeat. They spawn from the same position, but they'll reliably be able to make the first move before the first row fall -- except at Level 29, I suppose, haha. Level 29 would be a fall then move on the first active frame, five row falls, fall then move on the same frame, five row falls, ... .
Yeah, hard to say if you're not letting go of left. It could be that after the last move it's not ticking back up the full 6 before landing in the given configuration? I guess I'd have to see a given situation to make a more informed guess. Hope that helps. Feel free to ask any other questions as they come to mind. Very cool. I think I'm getting a better picture in my head. In fact, much of what you described with regards to what you see in the next piece coming out with DAS made sense to me. Just to put a slightly finer point on it, when you say "buffer," do you mean having reset the DAS counter? If so, I'm with ya. Between my mini break from high score attempts and relatively moderate scores in general, I hadn't been planning on recording my play. Starting to talk out more of these intricacies, though, I think I'm going to start doing that. Maybe I can capture this phenomenon I'm referring to with the whole "holding left/next piece fail" thing. Thanks a ton for your help. Getting to play with outstanding players at MGC and getting assistance on the boards is really helping to push me along. It's appreciated, for sure. Just to put a slightly finer point on it, when you say "buffer," do you mean having reset the DAS counter? Slides under things are "bufferable" actions. In a "video game-y" context, that is to say that there is a way to input them early and let them come out on the first available frame. By holding against a wall, the piece will automatically slide into the open space as soon as it falls to that height. This costs you your "positive edged" DAS sitting at 16 and drops you down to the falling edge of 10, and at high speeds won't count up enough to have full-full DAS again. So, the cost of buffering slide moves isn't as high as "whoops I tapped over on accident and lost all my 'momentum' completely," but it can still come into play. Sure thing, you're more than welcome. Ok. Here's one of those "DAS Fail" things...or whatever's actually happening. I move an I piece over a T. The next I piece fails to get over the T as the first I piece did. I'm holding left the whole time and never take my thumb off of the D-pad. Maybe there is a relatively straightforward answer to this, but i just don't know what to think about it.